Despite the many changes in governance regulation over the past decade, few boards function as a true corporate asset to the companies they oversee. In this book, Behan offers practical advice that a CEO, Chairman or board member can introduce at the very next meeting. Boardrooms are filled with intelligent, accomplished people—yet seldom achieve their full potential and add the kind of value for the CEO, executive team and company shareholders that many boards are actually capable of. 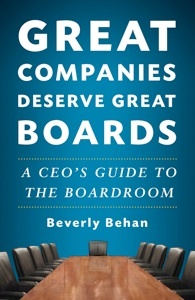 Beverly Behan draws on her experience working with more than 100 boards over the past 14 years—from major Fortune 500s to recent IPOs—offering no-nonsense insights that can take any board from mediocrity to the top of its game including establishing a constructive working relationship with your board; addressing some of the dysfunction that may lie within the board you’ve inherited, and making your board a significant asset to you, your company, and your executive team.